At the end of June, we released the MLB power rankings ticket price edition. In that article we took a look at each team’s tickets prices on the secondary market, and we promised a more comprehensive report to come. Throughout this week, up to the All-Star break, we will be giving you those updates, division by division, as promised. For each division, we are going to share the top ten games per division, as determined by average ticket price on the secondary market, as well as the top three games for each team in the division. We are beginning this midseason evaluation with the American League Eastern Division, taking a look at ticket sales for the New York Yankees, Boston Red Sox, Tampa Bay Rays, Toronto Blue Jays, and Baltimore Orioles. As noted in the power rankings, Red Sox tickets are currently the highest average ticket price on the secondary market, despite that the Yankees have the best record in baseball. The Yankees average ticket prices are a close third. As expected, the Red Sox top three games are more expensive than anyone else’s top three games. Following the Sox are the Yankees, Rays, Blue Jays and Orioles, respectively. Also, it is not surprising that Yankees vs. Red Sox games make up most of the top ten games for the AL East. Given the rivalry, as well as the success of both teams, we have come to expect that tickets for their games, and especially their games against each other will be quite a bit more expensive on the secondary ticket market. Interestingly, out of the top ten games for the AL East, half have occurred before the All-Star break, whereas the other half have yet to occur yet. Undoubtedly, there are numerous can’t miss events that are happening in the future that fans need to grab their tickets for now. One of the most notable events is the series between the Yankees and Red Sox that takes place from October 1st to October 3rd in Boston. Not only is it the last Yankees-Red Sox matchup in the season, but it’s also the last series of the season. Both teams expect to be in a playoff race come October, and those last games should be exciting. As a result, two of the three games are in the top ten for the AL East, and as a whole, the series’ average ticket prices is $157. Opening Day was popular on the secondary market, as well. Red Sox tickets for the season and home opener against the Yankees on April 4 averaged $153, while tickets for the Yankees’ home opener on April 13 were $140. Interestingly, for the Rays, Blue Jays and Orioles, fans were generally willing to pay more for to see the Yankees than the Red Sox, despite that Red Sox tickets at Fenway Park had the highest average ticket price in the MLB. Naturally, if a team has higher priced tickets at face value, the tickets on the secondary market are generally going to go for a higher price, as well. As a result, it is sometimes better to look at percent of face value. This indicates how much more (or less) than face value fans are willing to pay for their tickets on the secondary market. 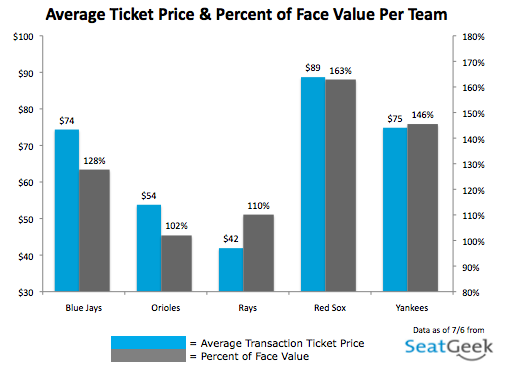 As the graph shows, Red Sox fans still pay the most, in terms of percentage of face value. Despite the fact that Rays fans pay less, on average, than Orioles fans, they are actually paying a greater percentage of face value than Orioles fans! Be sure to check back with SeatGeek for the rest of our MLB midseason reports. Next up is the American League Central. As always, if there are any questions, feel free to email justin@seatgeek.com, and don’t forget to like us on Facebook and follow us on Twitter @SeatGeek.